Germany’s parliament voted to establish a commissioner to deal with anti-Semitism in the country. Four mainstream parties endorsed the proposal, which noted that while most anti-Semitic crime in Germany is attributable to the far right, there are increased concerns about anti-Semitism among recent refugees and migrants from the Middle East and North Africa. All the mainstream parties supported the measure with the exception of the Left Party, which abstained in disagreement over wording related to migrants. The anti-immigrant Alternative for Germany, the right-populist party that entered the parliament for the first time in September, voted in favour. 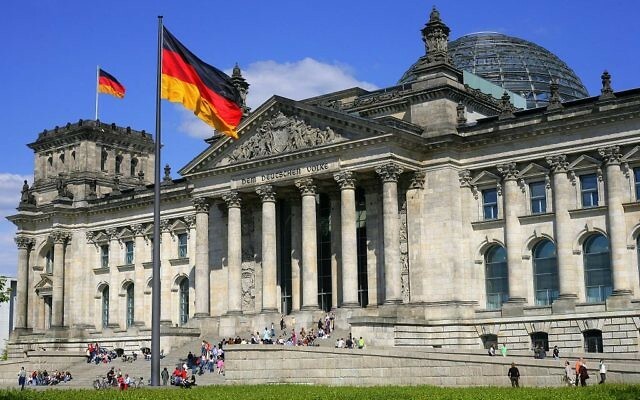 The bill says the Bundestag condemns and takes arms against all forms of anti-Semitism, and emphasises Germany’s responsibility to do so in light of the National Socialist genocide of European Jewry. Numerous Jewish leaders and institutions had been calling for the appointment of such a commissioner, whose role would be to develop and carry out programs aimed at combating anti-Jewish attitudes and crimes. Josef Schuster, president of the Central Council of Jews in Germany, who had long been calling for such a move, greeted the decision in a statement Thursday. Schuster said it is important to combat the problem “whether it comes from the middle of society, from right-wing extremists, or Muslims and Israel-haters.” He included the anti-Israel boycott movement, BDS, in his list of anti-Semitic movements to be fought, and said it was time that integration courses for new immigrants intensify their efforts to root out anti-Semitic attitudes. “But we explicitly reject a general suspicion against Muslims or even an instrumentalisation of the topic in order to exclude this religious minority,” he said. The move is an “important step” toward combating anti-Semitism in all political and social milieus, the former head of the council, Charlotte Knobloch, said in a statement. Knobloch, leader of the Jewish community in Bavaria and Munich, survived the Holocaust in hiding in Germany. But one commissioner can’t do much to help, according to German-Israeli historian Michael Wolffsohn. He recently told the German public broadcaster MDR that the idea was appreciated, but it was “naive” to think one person could take on an entrenched hatred that has lasted a millennium. Bundestag Vice President Petra Pau of the Left Party, herself an activist against anti-Semitism, had told the Berliner Zeitung before the vote that she found fault with the proposal for its emphasis on immigrants as a source of the problem. Lawmaker Volker Kauder, head of the Christian Democratic Union Bundestag faction, said German society must ensure that Jewish life can continue without fear. While acknowledging that the far right is to blame for most anti-Semitic crimes, he said an increasing number of such acts are committed by people “from a region where hatred of Israel and anti-Semitism” is deeply rooted. According to news reports, it remains to be decided whether the position will be linked to the Chancellory or another ministry.